Mammals, as a rule, are warm blooded air breathers, and that is not ideal for the conditions of the deep sea. Air-filled lungs are easily crushed by the pressure of a hundred meters or more, squeezing out any oxygen they held. Water has a high specific heat and anyone who has taken “a polar plunge” for charity knows how quickly it can remove heat from a warm blooded animal. Yet, marine mammals have thrived in the ocean, and have evolved adaptations that allow them to dive to extraordinary depths. Here is how they do it. Pressure increases by one atmosphere for every ten meters that you descend into the ocean. At sea level we experience 14.7 pounds of pressure on every square inch of our bodies. However, sea water is a lot denser and the further you go down, the greater the pressure gets. Pressure, doesn’t affect fluid filled tissues, but it immediately reduces the volume of the air filled spaces. You and I can feel pressure in the air-filled sinuses of our face as we dive to the bottom of a pool (about three meters.) A diving marine mammal will have all of the air squeezed out of its lungs within a few dozen meters. Pressure also increases the rate at which gases dissolve into the liquid portions of our blood. If a diving marine mammal tries to return to the surface rising too quickly, those dissolved gases can form bubbles that lodge in blood vessels of critical organs, creating a condition called decompression sickness or “the bends.” Early deep sea divers called this condition the bends because of the intense joint pain it could cause. The bends can be debilitating and deadly not just in people, but in marine mammals as well. Click to read more about the bends. Oxygen consumption can become an issue for you and I in less than a minute if deprived of new oxygen. Try squeezing your nose and holding your breath – how long can you last? The best free divers in the world can’t hold their breath for longer than five minutes, yet some marine mammals can stay down without a breath for as long as ninety minutes. Nitrogen narcosis. Air is 70% nitrogen, but under normal atmospheric conditions almost none of it gets dissolved in our blood. That’s a good thing, because when it does, it can cause a drunken-like condition called nitrogen narcosis. Under higher pressures, greater levels of nitrogen can dissolve into a diving animals blood and eventually becomes toxic. It can lead to impaired judgement and eventually death. Nitrogen narcosis typically limits air breathing scuba divers to depths of one hundred feet or less. Anyone human diving beyond that typically uses a gas mixture with less nitrogen. The ocean is cold. Even in the tropics, below 200 meters ocean water temperatures approach freezing. Warm blooded mammals need to maintain a constant body temperature to survive. In addition, water’s high heat capacity can remove heat from the body nearly twenty times faster than air. Mammalian bodies float. Ever tried to swim to the bottom of a swimming pool? It takes a lot of work. That’s because the air and fat in most mammals tissue cause us to float. William Beebe and Otis Barber in the Bathysphere. This first true deep diving submersible was little more than a steel ball attached to a heavy line, image from Wikipedia. Pressure: Pressure normally limits scuba divers to less than thirty meters. Submarines use closed steel and titanium spherically shaped containers with small thick windows to withstand increasing pressure. Oxygen: Scuba divers use compressed air, or other gas mixtures stored in steal containers. Nitrogen narcosis and decompression sickness: Scuba divers follow strict diving charts with slow assents and descents. Divers who experience nitrogen narcosis or the decompression sickness may have to spend time in specialized decompression chambers. The Cold: Scuba divers wear thick neoprene wet suits or insulated dry suits. Buoyancy: Scuba divers wear lead weights on their belts and submersibles may have thousands of pounds of lead weights attached to the sub to help them sink. The sperm whale, seen in the diagram above, is the diving champion of marine mammals. Sperm whales can stay under water for over 90 minutes and dive to depths of nearly 10,000 ft. It has an extraordinary array of adaptations that allow it to dive so deep. All marine mammals can make dives that are deep compared to human beings. Here is how they do it. If you dive to the bottom of a swimming pool, the first thing you might notice is that your ears hurt. This is because of the difference in pressure between the air in your ears and the water. Air (as a gas) can be compressed, while water (as a liquid) cannot. At sea level a body experiences 14.7 pounds per square inch of pressure (1 atmosphere). For a diving marine mammal, another atmosphere of pressure is added every ten meters that they go down. Thus, a male elephant seal diving to 1,000 meters is experiencing 100 times the pressure that he would at the surface. Over evolutionary time, most marine mammals have lost their external ears and sinuses. Without air-filled ears, a diving marine mammal does not suffer the effects of changing pressure. Sea lions and fur seals do have ears. During a dive their ears will fill with a bloody fluid, forcing any air out. Human beings store oxygen primarily in their lungs than any other place. In preparation to hold your breath, it would make sense that you would take a deep breath first. For diving marine mammals, this presents two problems. First, air is buoyant, making diving difficult. Second, as was mentioned above, air is easily compressed, leading to a potential collapse of the lungs. Most marine mammals have lungs that are able to collapse and re-inflate easily. They tend to be long and tubular with built-in protective rings to keep valves open. Also, marine mammals tend to exhale right before a dive. They have very muscular and efficient lungs which can exhale up to 90% of the air in their lungs in any give breath (an athletic human can do around 10%.) Thus, by removing the air from their body, a diving marine mammal has very little problems with changing pressure. No air, no problem. So if marine mammals exhale before they dive, how do their muscles get the oxygen they need to work? The answer is that they store oxygen in their blood, and in their muscles rather than in their lungs. Marine mammals have a very high blood to body volume ratio. Marine mammals also have a higher percentage of red blood cells than most mammals (human = 36%, seals = 50%.) By comparison, this makes their blood very thick and viscous but much more adept at oxygen storage. Marine mammals also have a high concentration of hemoglobin in their blood and myoglobin in their muscles. Both of these molecules have a high affinity for oxygen atoms and are used to store oxygen in body tissue. Click the link to check out how human free diving champions match up against marine mammals for deep sea dives. The mammalian diving reflex allows mammals to lower their heart rate and ultimately survive submersion in water for extended periods of time. Bradycardia, as it is also known, is triggered by cold water contact to the nerves of the face. It occurs in all mammals, but to a much greater extent in marine mammals. 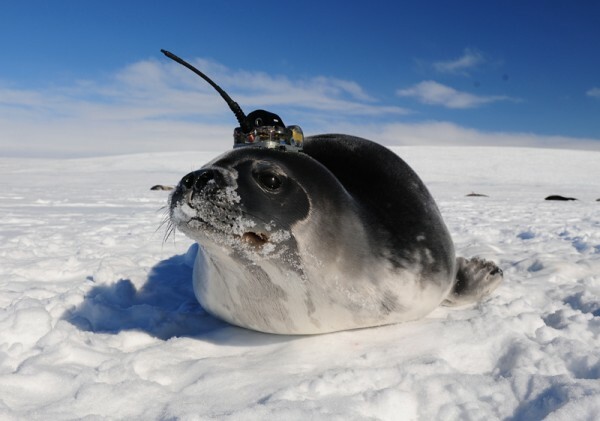 Weddell seals have been measured to lower their heart rate to as low as four beats per minute when submerged in cold water. When exercising, we say that when humans have run out of oxygen they have gone anaerobic. This means that muscle cells do not have sufficient oxygen to break sugar apart through aerobic respiration. This is very taxing on muscles and leads to soreness and fatigue. In marine mammals, most body organs appear to switch to anaerobic respiration while diving without suffering the same ill effects. We still don’t know exactly how they do this. Marine mammals regularly make deep dives and return to the surface very quickly. So why don’t they have problems with “the bends?” It’s simple – they exhale before they dive. No air means no problem. In addition, many marine mammals have an extensive “net” of blood vessels feeding into their brain. It’s known as the “retia mirabilia,” and it likely serves several functions, but one of them is capturing bubbles that may form in the blood stream. “Until recently the dogma was that marine mammals have anatomical and physiological and behavioral adaptations to make the bends not a problem,” said MMC Director Michael Moore. “There is no evidence that marine mammals get the bends routinely, but a look at the most recent studies suggest that they are actively avoiding rather than simply not having issues with decompression.” – Woods Hole Oceanographic Institute. Many human scuba divers have known the pain and discomfort associate with having a small hole in their wetsuit during a cold water dive. Water dissipates heat from the body much faster than air. A person who falls in water near the freezing point will be hypothermic within a few minutes, yet marine mammals dive to depths where the temperatures approach freezing. The most obvious way that marine mammals stay warm is that they tend to be large and rather “sausage shaped.” This shape gives them a low surface area to volume ratio. Per unit volume, there is less skin exposed to cold moving water. Marine mammals also have a lot of blood relative to their body size. Water has a high heat capacity and does a nice job of maintaining body temperature. Most marine mammals have a thick layer of fat know as “blubber.” This fat layer also serves as calorie storage for marine mammals that undergo long periods of fasting. Smaller marine mammals tend to have highly insulated layers of fur. The extreme example of this is the sea otter. Sea otter fur is two layers thick, and very effective at trapping air to aide in insulation. Sea otters may have as many as one million hairs per square inch. That’s ten times as many hairs as the average human has on their whole head. No part of a mammal is more buoyant than the air in their lungs. For marine mammals, the key to reducing this buoyancy is to exhale before diving. Removing oxygen from the lungs makes animals slightly negatively buoyant. In order to save energy diving, marine mammals will often sink in a “sleep-like state” during the descent of a long dive. This is only possible after the lungs have been collapsed. The very fact that “marine” mammals exist is an extraordinary example of evolution. To illustrate this, describe some of the physiological difficulties of being the super hero Aquaman. Describe the recently evolved adaptation that has allowed the The Bajau people to become better divers. Be specific to how the adaptation is helpful. How do marine mammals deal with the extreme pressure they encounter on their dives? If the text above isn’t enough, check out this great article from Scientific American. 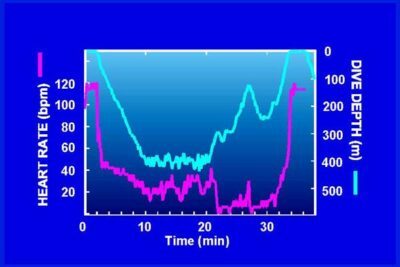 How do marine mammals deal with oxygen storage? It may help you to learn what scientists have recently discovered about the myoglobin found in Marine Mammals. What kinds of things have human free dive champions learned that have greatly extended their dives? Based on what you have read and heard so far about marine mammals, are their any overlaps in behavior between marine mammals and human free divers? How do marine mammals avoid freezing to death while diving? What have GPS tags on elephant seals revealed about where elephant seals go and how deep they dive to feed? Examine the attached diagram of a typical Fin Whale feeding dive. Look at the fluking pattern (these are beats of their tail). How hard are they swimming when they dive? How hard are they swimming when they return to the surface? We have recently learned that diving whales can get decompression sickness (The Bends.) What have we learned, and how might the US navy be putting marine mammals in harms way? 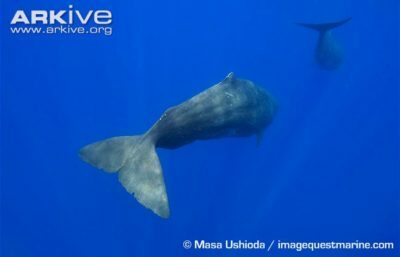 Read the description of the sperm whale from Arkive.org, and explain how the spermaceti organ can help to regulate buoyancy in sperm whales. This figure shows the diving behavior of a male elephant seal. Dives lasting 20-40 minutes of nearly vertical profiles are followed by very short breaks. Image from, National Marine Mammal Laboratory, Alaska Fisheries Science Center, NOAA Fisheries, used with permission.